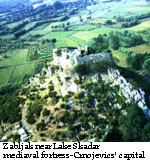 After the Balsic dynasty died out in 1421, the focus of Doclean/Zetian resistance shifted northward to Zabljak (south of Podgorica) in the basin of Shkoder (Skadarsko) Lake. Here, a chieftain named Stefan Crnojevic set up his capital, adding another important chapter to the turbulent history of Montenegro. Like its predecessors Balsics, Crnojevics entered historical scene while Montenegro was suffering from a political turmoil and was threatened to be divided among neighbouring conquerors - Turks, Venetians, and Serbian despots united with the Turks. More precisely, Djurasevic family returned to its previous family name, Crnojevic, and entered political scene during the time of Balsa III. They helped Balsa III during Shkoder's Wars (1411-1413 and 1419-1421). 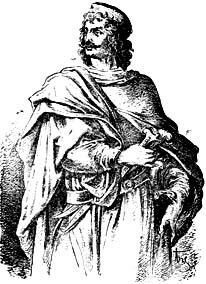 Since Balsa III handed Zeta to his father in law Stefan Lazarevic, Crnojevics formally recognised the rule of Stefan Lazarevic in Zeta (1421-1427). However, after the death of the Serbian despot Stefan Lazarevic, Zeta was inherited by his nephew the Serbian despot Djuradj Brankovic who, at the time, needed to pacify his greatest enemy, the Ottomans and could not pay particular attention to Zeta. So grave the Serbia's position was, that despot Djuradj had to accept to pay yearly tax of 50 000 Ducats to Turks, as well as to send his beloved daughter Mara to Harem and make available 20 000 soldiers whenever Sultan needed them. Capitalising on the weak position of despot Djuradj, both Venetians and Herzegovian despot Stjepan Vukcic Kosaca, conquered parts of Djuradj's territory. Since Kosaca was a Turkish vassal, Stefan Crnojevic, who had already established himself as the head of Crnojevic dynasty (around 1435) in Upper Zeta/Montenegro (as this territory was known after this date), was forced to make territorial concessions. In addition Kasaca took Stefan's son Ivan as a hostage hoping that this will force Stefan to be on his side when need be. In order to strengthen his power Stefan Crnojevic married Mara, the oldest daughter of a respected Albanian lord, Ivan Kastriot. This marriage became particularly important after Djerdj, a son of Ivan Kastriot, allied with Ungarian army to defeat Murat II, and cut ties with Turkey, making himself the legendary leader (Skender-beg) of Albanian liberation movement. More importantly, threatened by the Serbian despots and their Turkish allies on one hand, and lured by the promise of his son's Ivan liberation from Kosaca's captivity on the other, Stefan Crnojevic forged an alliance with Venice. After years of negotiations Stefan finally agreed to ratify the agreement (06.09.1455), according to which he was to be recognised as the undisputed leader in Zeta who would rule on behalf of Venice, and be awarded the titles of Captain and Duke in addition to an annual fee of 500 Ducats. On his part, Stefan undertook to make available military capacity to Venice for two months a year on his expense. This agreement is characterised not as recognition of Venetian sovereignty over Montenegro but rather as a military pact, which allowed Stefan to move majority of his forces from the borders with Venice toward Herzegovian and South-eastern borders. 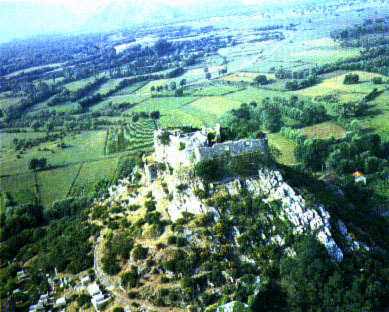 The majority of Turkish attacks and intrusions were coming from the fortress of Medun, which was given to Turks by Milos, a Duke of Djuradj Brankovic in 1456, after three successive defeats in the hands of Stefan Crnojevic. The territory over which Stefan Crnojevic had sovereignty, apart from mountainous area under mount Lovcen and Cetinje, comprised 51 municipalities. It included Rijeku Crnojevica, Zeta's plain, Bjelopavlici, Pjesivci, Malonsici, Piperi, Hoti, Klimenti, and other "clans" (municipalities) with 3500 households and the population of around 30 000 (D. Zivkovic, Istorija Crnogorskog Naroda, 1989, p. 341). Total population of Zeta/Montenegro including regions under the Venetian, Kosaca's and Turkish rule, was about 80 000 (ibid). While defending his country against Turks, Stefan Crnojevic managed to stabilize it internally, establishing a new socio-political basis, creating a new flag as the state symbol, and making solid foundations for his dynasty. Stefan Crnojevic, thus, laid the foundations for the future post-feudal atypical state, that remains a state for itself, unusual and unrepeatable. The meaning and purpose of its existence was the freedom for which its people were ready to give everything including their lives. Montenegro as it was called thereafter, became among fellow Slavs the symbol of freedom, liberation, and unconquered fortress that even defied the mighty Ottoman Empire. Stefan Crnojevic was succeeded by his son Ivan, who ruled Montenegro from 1465 to 1490. Immediately after taking a rule, Ivan attacked Venetians braking the alliance his father had forged. However, after an initial success Ivan realised that the major danger for his country is represented in Ottoman Empire, so that he re-established the alliance with Venice. Ivan fought numerous battles against Turks. He took part in defending Shkoder (Skadar), where the Venetian defenders fought off forces of Turkish Sultan Mehmed II and eventually won the war in 1474. However, this victory was not to be long lasted, since Sultan forces conqured Shkoder in 1479 and signed a peace treaty with Venice unfavourable for the later. Knowing that the Turks will try to punish Ivan for his part in the war on the Venetian side, Ivan moved his capital Zabljak from the basin of Shkoder (Skadarsko) Lake to Dolac under mount Lovcen. In 1482 Ivan built his court in Dolac (Cetinje) inspired by other European feudal courts. Apart from his modern palace, Ivan built a monastery (1484) which became the residency of Montenegrin Metropolitans (1485) and the see of a bishopric. Cetinje, thus became the capital of Montenegro (Podlovcenska Crna Gora) from which Ivan organised the defence of his country. He was dreaming to organise an anti Turkish alliance comprised of Napolitan, Venetian, Ungarian and his forces. However his dream could not be fulfilled since the Venetians did not dare to give help to Ivan after the peace treaty with Turkey forged in 1479. Left on his own, Ivan single-handedly managed to preserve sovereignty of Montenegro from frequent Turkish attacks and offensives. During Ivan life the rule of Montenegro was passed to his oldest son Djuradj while his youngest son Stanisa, disillusioned with the impossibility to succeed his father went to Istanbul and converted to Islam. As a loyal servant of Sultan, Stanisa later became the Shkodrian 'sandzak-beg' under the name of Skender. His brothers Djuradj and Stefan continued the struggle against Ottomans. The historical facts are unclear and disputed, but it seems that Venetians, frustrated by their own inability to subdue Crnojevics to their own interests, managed to kill Stefan and deceitfully sent Djuradj to Istanbul. Namely Djuradj visited Venice in order to work on the "wide anti Turkish campaign" but was kept in captivity for some time while his brother Stefan was defending his country against Turkish forces. It is likely that on his returned to Montenegro, Djuradj was kidnapped by the Venetian agents and sent to Istanbul via Shkoder under accusation that he had been organising a Holly War against Islam. There are some unreliable claims that Djuradj was given to rule Anadolia but in any case the reports about Djuradj life ceased after 1503 (D. Zivkovic, Istorija Crnogorskog Naroda, Cetinje, 1989). As noted by the Montenegrin historian D. Zivkovic (1989, p.367), even though we can not be sure how Crnojevics ended their lives, we can say with certainty that Djuradj and his brother Stefan left the Montenegrin throne forever in 1496 and 1498 respectfully. The end of 15 century thus signifies the end of the rule of famous Crnojevics dynasty in Montenegro. That does not mean that Montenegro (Podlovcenska Crna Gora), in contrast to other Balkan countries, lost its factual sovereignty, freedom and independence. On the contrary; Montenegrin State strengthened on different socio-economic foundations, became the lighthouse of freedom for all Balkan countries as envisaged by Stefan Crnojevic, the founder of Crnojevic dynasty. The frequent change of borders of the state of Zeta, later called Montenegro (from Venetian form of Monte Nero), predictably had an impact on the religious confessions of the local population. Some historians claim, that until the end of 14 century Catholic ideology embodied in the offensive religious and cultural policies in the coastal regions of Zeta under Venetian rule, made Catholicism to be dominant religion in this region pushing Orthodox Christendom inward toward continental Zeta (D. Zivkovic, 1989, p.377). Thus, limiting it on the small area under the mount Lovcen where eventualy, it was brought under jurisdiction of Cetinje diocese. The proclamation of Orthodox Christendom as a state religion by Balsa III, did not help much the Orthodox population in the regions under Venetian rule. This part of population was systematically converted to Catholicism or Uniatism. Religious policies of various serbian despots, Balsa III and later Crnojevics paved the way for the mono-confessionalism of population within the borders of Montenegrin state. A Montegrin historian, D. Zivkovic (1989, p.377), suggested that the part of Zetian/Montenegrin Orthodox population, determined to preserve its faith moved to the unoccupied territory ruled by Crnojevics. Furthermore, according to Zivkovic (1989, p. 377) the population under "Crnojevic political ingerence" since time of Ivan Crnojevic and thereafter, has belonged to the Orthodox confession. The religious background of Zetian State under Balsa III and his mother Helen, and their followers dynasty Crnojevics, helps understand their cultural aspiration of the time. Among the most important literal works of that time is 'Gorica's Almanac' (Goricki zbornik). The writing of this work (1441-1442) was sponsored by Balsa's mother Helen who, after the death of her second husband, Sandalj Hranic Kosaca (1435), decided to spend the end of her life in a monastery. 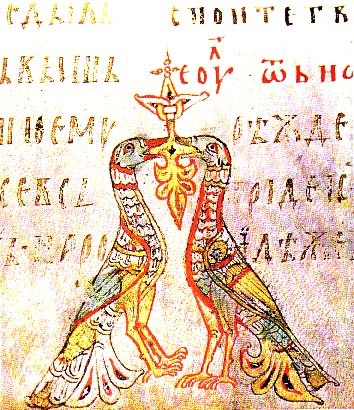 Goricki zbornik is synthesis of Byzantine theological doctrine and, like other writings of the time in this region, was written in old church-Slavic language of Zetian/Montenegrin edition. An important work of church-legal literature is a translation of 'Syntagm' (1380) by Matija Vlastar. By its spirit and letter, the Vlastar's Syntagm glorified the Greek-eastern position of Cezar-Popeism. The doctrine presented in the Valtazar's Syntagm was embraced by Stefan Crnojevic in his struggle against Serbian despot Djuradj Brankovic. Stefan found in the Syntagm international legal dimension where was claimed that "it is a natural right that every nation (people) has a legitimacy of her own within countries of Eastern Orthodox hemisphere". A considerable part of cultural legacy of the Balsics' and Crnojevics' epochs could be found in the numerous religious books of Greek Eastern provenience. The most important among them are listed below. Their titles and location, where known, are written as known in Montenegro, without translation, since most of them have not been published yet. 'Vranjinsko cetvorojevandjelje' (1436) - Odessa private collection. 'Praksapostol' (1441/42) (The Epistles of Apostles) - disappeared in the Serbian National Library in 1941 destruction. 'Triod Moracki' (1444) National Library, Berlin. 'Sabornik cetirem mjesecem' (1484/84) - University Library, Torino. 'Caslovac' by Nikola Kosijer (1484). 'Cetinjski psaltir' (first half of XV century) - University of Zagreb. In several monasteries in Montenegro there is a number of important old books and writings. Most of these books could be found in the monastery Nikoljac in Podvrh near Bijelo Polje, Monastery St. Trinity near Pljevlja, and Monastery of Cetinje. The written religious legacy from XVI and XV centuries, although neither well preserved nor researched sufficiently, proves that the literature was developed in Zeta/Montenegro during the Balsic' and Crnojevics' epoches. Thus, Zetian/Montenegrin cultural environment, from early Doclean period to Balsics' and Crnojevics' phase, had a continuity of cultural development that was not discontinued even when it was under foreign (Raskian) supremacy. Given that on this territory were written famous works as 'The Pontificate of Bishopric of Kotor' (end of XI or beg. of XII cent. ), 'Kingdom of Slavs' also known as 'Regnum Sclavorum' and sometimes called 'Chronicle of Father Doclean' written by an unknown Doclean Benedictine priest, as well as 'Miroslav's Gospel' from the end of XII century, it is no surprise that here was founded the Crnojevics' print shop as the highest expression of the earlier cultural stratum. The Crnojevics' print-shop was the first in Southestearn Europe and the first among the South Slavs. The print-shop had enormous role in the diffusion of books and literacy, as well as in spreading the culture well beyond the local area. It is believed that the print press was brought in Montenegro from Venice between 1476 and 1478 by Ivan Crnojevic, the most educated Montenegrin at the time. The press could not be installed to operate before 1485, when Cetinje Monastery was erected, because Crnojevic were preoccupied with the wars against Ottomans in which former lost control of the Capital Zabljak (1478) in the basin of Shkoder Lake. Historians believe that subsequent seven years, after installation of the print shop in Cetinje Monastery, were used to train the printing staff led by famous monk Makarije. The first book printed on the Obod press by Makarije was the Orthodox service book, the 'Octoechos' (Oktoih), which is the first printed Cyrillic book of the South Slavs (January 1494). In the Orthodox Church, the Oktoih is a book of liturgical hymns, intended to be sung in eight parts. Cyrillic incunabulas 'Oktoih Prvoglasnik', 'Oktoih Petoglasnik', 'Psaltir', 'Trebnik', and 'Cvetni Triod' printed in Cetinje between 1493 and 1496 during the rule of Djurdj Crnojevic represent the most impressive examples of the culture of the times.